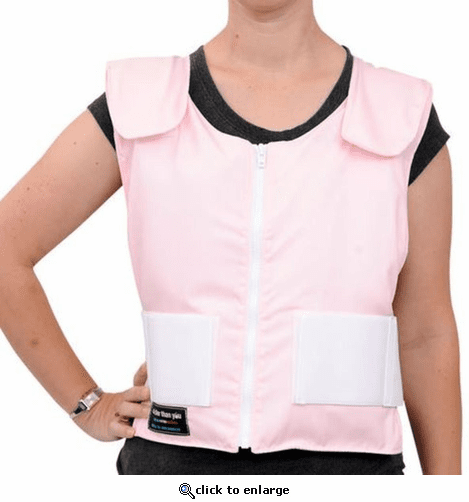 Not only will the Original Cool Vest – Pink keep you cool, it sends a clear signal to the world that you won’t allow heat stress to win. This durable cooling vest is made from polycotton and includes one GlacierPack Comfort set. Made from a hermetically sealed full barrier film, this pack is designed for easy cleaning, disinfecting or sterilization. Whether you wear it under or over your clothing, the Original Cool Vest – Pink will keep you comfortable. Its adjustable over-the-shoulder and side elastic straps allow it to fit most body types, and the heavy duty front zipper enables easy on/off wear. When you need to clean the Original Cool Vest – Pink, simply remove the cooling packs, hand wash the vest with cold water and line dry.